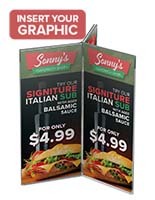 Are you shopping for a table sign that allows for multiple signage within the same display? 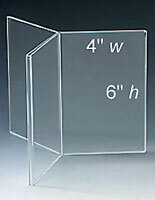 Are you tabletops crowded with several different frames? 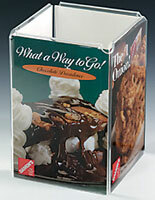 This table sign, also called a menu card holder, combines several frames into one compact unit. 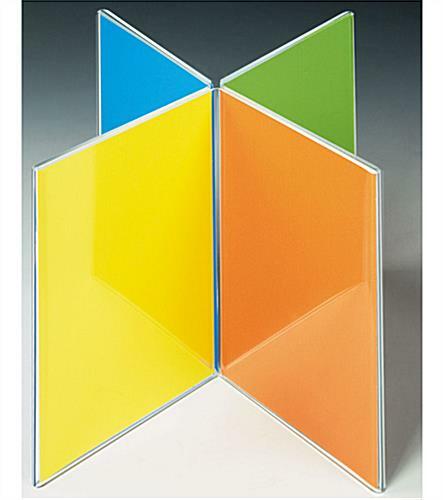 This multi-panel design helps to minimize the tabletop clutter that sometimes occurs in busy restaurants. 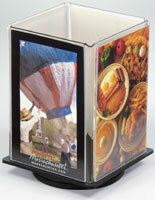 Place this table sign in the center of a setting to provide each diner with a direct view of the advertisements. 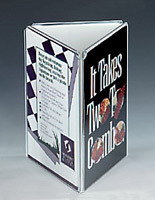 Use each panel to promote a different menu listing, or choose to insert the same image in each side. This table sign, menu holder, is typically used to display a dessert menu along with a wine list or a seasonal beer on tap. Another use for this acrylic print frame is as a display within a shopping mall to announce current events happening within the different stores. This table sign is simple to make changes with an open top and bottom. Simply slide the old graphics out and replace with new signage. 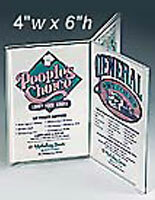 The 4" x 6" frame is a convenient size to work with and is also a popular picture size. Use this table sign, also known as a photo frame, to display family pictures in an office or cubicle. 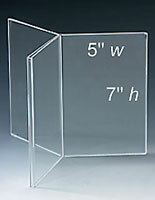 This versatile multi-panel display can be used in any type of setting. Each table sign is great for displaying multiple images at the same time as well as keeping the prints protected from dirt and dust. To clean this menu card holder; use a damp rag and towel dry. 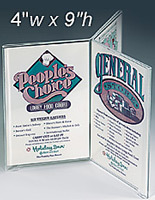 This signage frame is the ideal table sign for any restaurant looking to increase sales and maximum exposure of menu items. We are unable to accept orders for less than 36 units.